How To Use Hotspot iPhone X - You can use Instant Hotspot on iPhone X to provide Internet access with hotspot iOS 11 to your other iOS devices (iOS 10 or later) and Mac computers (OS X 10.10 or later) where you’re signed in to iCloud with the same Apple ID. Learn abut iPhone hotspot, personal hotspot on iPhone X, how to turn on hotspot, how to resolve problem when iPhone personal hotspot not working, and more. 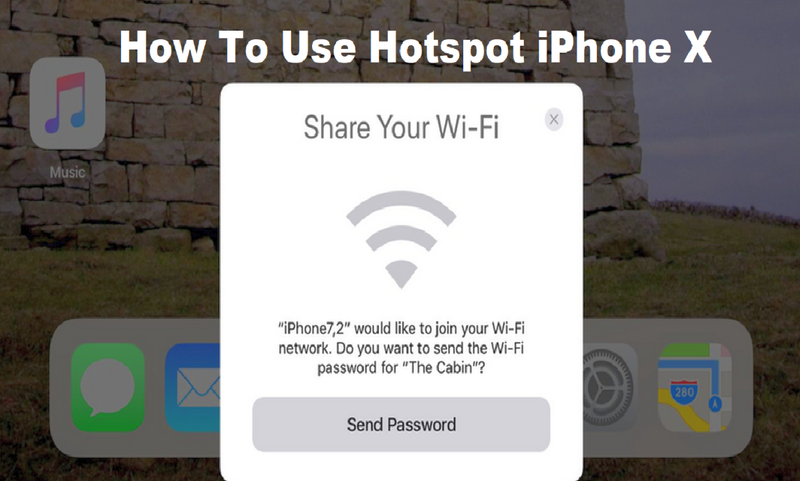 iPhone X Instant Hotspot uses your iPhone Personal Hotspot, without you having to enter a password or even turn on Personal Hotspot. You can use instant hotspot on iPhone X by turn it on, go to Settings > Wi-Fi on your other iOS device, then simply choose your iPhone network under Personal Hotspots. On your Mac, choose your iPhone x network from your Wi-Fi settings. When you’re not using the hotspot, your devices disconnect to save battery life. This iPhone X feature may not be available with all carriers. Additional fees may apply. Contact your carrier for more information. Use iPhone X Personal Hotspot iOS 11 to share your iPhone Internet connection. Computers can share your Internet connection using Wi-Fi, Bluetooth, or a USB cable. Other iOS devices can share the connection using Wi-Fi. Personal Hotspot works only if iPhone is connected to the Internet over the cellular data network. How to turn on personal hotspot on iPhone X? Go to Settings > Cellular, then tap Personal Hotspot—if it appears—to set up the service with your carrier. USB: Connect iPhone X to your computer using the cable that came with it. 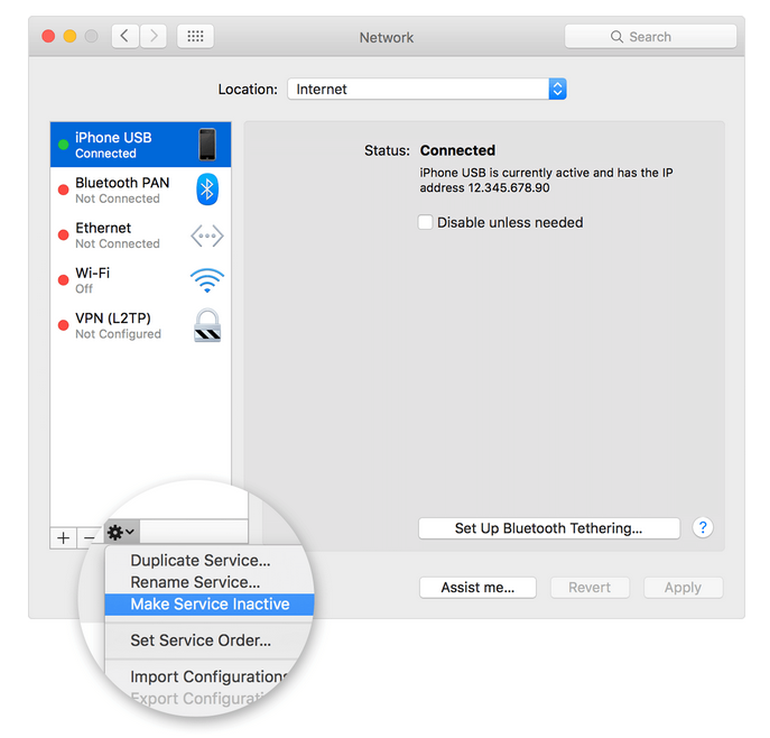 In your computer’s Network preferences, choose iPhone, then configure the network settings. Bluetooth: On iPhoneX, go to Settings > Bluetooth, then turn on Bluetooth. To pair iPhone X and connect iPhone with your Bluetooth device, refer to the documentation that came with your device. When a device is connected, a blue band appears at the top of the iPhone screen. The Personal Hotspot icon appears in the status bar of iOS devices using Personal Hotspot. Go to Settings > Personal Hotspot > Wi-Fi Password, then enter a password of at least eight characters. How to Change iPhone X name of your Personal Hotspot. 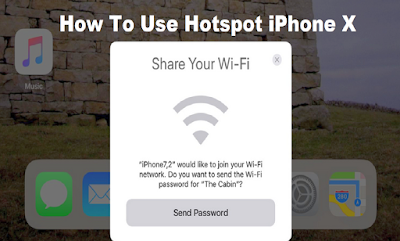 You can change the name of your Personal Hotspot by changing the name of your iPhone. Go to Settings > General > About > Name. To monitor cellular data network usage follow this iPhone X user guide: Go to Settings > Cellular. If you problem when iPhone personal hotspot not working on iPhone X or other iOS device, follow these steps. Follow these iPhone tutorial steps by steps first carefully, and try again after each step until you can resolve iPhone X problem. Check that iPhone X Personal Hotspot is turned on. There are two places to look: Check in Settings > Personal Hotspot. Then check in Settings > Cellular > Personal Hotspot. If you can't find or turn on Personal Hotspot, check that your wireless carrier enabled it and that your wireless plan supports it. Switch Internet connections. For example, switch from a Wi-Fi connection to Bluetooth or USB. Restart the iPhone X. Then restart your other device. Make sure that you have the latest version of iOS on your iPhone or iPad and your other device (update latest iOS). On the iPhone X, go to Settings > General > Reset > Reset Network Settings. On the device that you want to connect to, go to Settings > Personal Hotspot and make sure that it's on. Then verify the Wi-Fi password and name of the phone. Stay on this screen until you’ve connected your other device to the Wi-Fi network. Check that you're using the correct Wi-Fi network. The network name should be the same as the iOS device providing Personal Hotspot. You can check the name of your iOS device in Settings > General > About. Check how many devices are using Personal Hotspot by looking in the status bar of the device that provides Personal Hotspot. Some wireless carriers limit the number of connections you can have. On the device that needs to connect to Personal Hotspot, turn Wi-Fi off and back on. Follow the steps below for your Mac or Windows PC. To avoid unnecessary data charges, turn off Personal Hotspot when you don't need it. If you don't, every time you plug your iOS device with Personal Hotspot into your computer to charge, your computer will connect to Personal Hotspot. With a USB cable, connect your Mac to the iPhone X. Then make sure that iTunes recognizes your iOS device. Select iPhone USB. If you don’t see it, click plus icon and add it. If you already have a different network connection, your Personal Hotspot connection might not activate until you uncheck “Disable unless needed” under Status. Click Settings icon and choose Make Service Inactive. Then choose Make Service Active. With a USB cable, connect your computer to the iPhoneX, make sure that you can locate and view your iPhone or iPad in iTunes. On the device providing the Personal Hotspot, go to Settings > Bluetooth. Make sure that Bluetooth is on. On an iPad or iPod touch, tap Settings > Bluetooth. Tap the device that provides Personal Hotspot to pair your devices. You can't share your cellular data connection with another iPhone using Bluetooth. On a Mac with OS X, choose Apple Menu and click System Preferences > Bluetooth. Next to the device providing Personal Hotspot, click Pair and follow the onscreen instructions. On a PC with Windows, click the Bluetooth icon in the Notification area, choose Add a Bluetooth Device, and follow the onscreen instructions. On your Mac, click bluetooth icon in the menu bar. Choose iPhone X Hotspot, then choose Connect to Network. You can confirm your connection in System Preferences > Network. If you can't connect, skip to the next section. On your Windows PC, click bluetooth icon in the Notification area and choose Join A Personal Area Network. Right-click your device and hover your pointer over "Connect using," then select "Access point." If you still can't connect, skip to the next section. On the iPhone X, go to Settings > Bluetooth and turn Bluetooth off and back on. Do the same on the iPad or iPod touch that needs to connect to Personal Hotspot. On your Mac, click bluetooth icon in the menu bar, then turn Bluetooth off and back on. On your PC, choose Settings, click bluetooth icon, and turn Bluetooth off and back on. On the iPad or iPod touch that needs to connect to Personal Hotspot, tap Settings > Bluetooth. Tap information icon beside the name of the device that provides Personal Hotspot, then tap Forget this Device. Restart the iOS device that needs to connect to Personal Hotspot. On your Mac, click bluetooth icon in the menu bar. Choose Bluetooth Preferences, select the device that provides Personal Hotspot, and click X icon to remove it. Then restart your computer. On your PC, click bluetooth icon in the Notification area. Select "Show Bluetooth devices" and select the device that provides Personal Hotspot. Then click Remove, click OK, and restart your computer. Now you can pair your devices and try again to connect to Personal Hotspot.